With Fathers Day a mere week away, I really wanted to get my guide up as to what I think might be helpful this year. In my eyes, men are quite easy to buy for, well the men in my life are - My Dad 'gangan' is an avid Aston Villa supporter and beer guzzler so you always have both of those as fail safes and John, my other half is a complete tech nerd, a motherboard sends him into over drive (this is not a joke) But I know that isn't the case for every guy out there and those things would appeal to such a small minority, so each time a special occasion arrives, I try to feature products I think that would appeal to a plethora of the male species. 1. First up on the list is this fantastic book by Lost My Name it's called the Kingdom of you and it's just truly magnificent, I love lost my name I think they're an amazing brand that come up with some of the most beautiful stories - hence why they've featured in some of my previous guides. The Kingdom of You is a wonderful story in which you can not only personalise the name and look of your own character but add in a few of their favourite things too, John always enjoys reading the boys bedtime stories as much as they love him to read to them, so when he opened this book to find it was all personalised about him - he was delighted and Noah found it ever so funny. It makes a perfect present from smalls to their Dad on his special day. 2. Slippers, the most cliche Dad item surely? John demolishes slippers, I'm not sure how he manages it but he does, they usually end up in such a state as he's just 'nipped to put the bin out' or I've sent him out to the ice cream van in a rush. It was about time he had a fairly decent pair, I am quite jealous, these UGG slippers are so soft it's unbelievable, during the winter months too your feet would be super snug and cosy. 3. Looking to try and be frugal this fathers day? Why not create a jar of wishes, it's super simple you could probably even use an old coffee jar, wash the label off and fill it up with little commands you'll happily oblige too. I thought of this more in mind for your other half from the children and you, it could include washing the car, breakfast in bed, a lay in... the possibilities are endless and it would take no time or cost at all. 4. A costa gift card, now that's something I wouldn't mind receiving. If you're Dad is on the go, he's more than likely to be nipping into coffee shops, particularly if he's a commuter as what's a train ride without a hot drink and pastry? It's a pretty safe option that you know they'll get use out of. 5. Amara have a seriously good selection of gifts this year, and I thought this charging station would be great for the office worker or like John, the techie. It's incredibly stylish, can charge a wide variety of different phone specs and means that if your phone is charging and you're trying to watch a video - you still can as it's stood up. 6. Last but not least, the novelty card, a book of foreign swears - what could possibly go wrong? *Some products were sent to me in exchange for featuring. Oh my husband would love the third one! 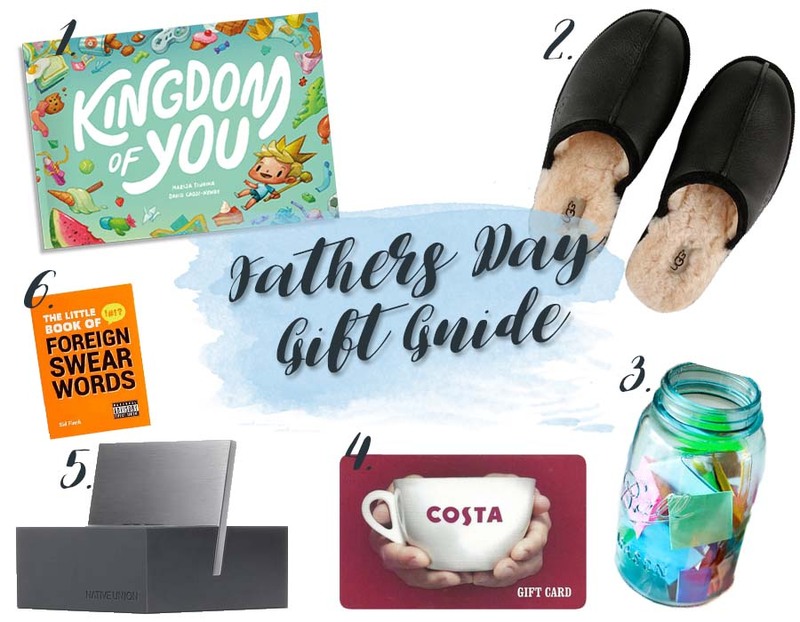 I'll keep this post in mind in November when the Father's Day arrives here :-) such a great list! Love the kingdom of you book, I'm going to have a look at this now as we're huge fans of the lost my name story! Ugg slippers look dreamy. Some great gifts here. Costa gift card will come in handy for my other half...can't get enough coffee yet I can't stand the taste of it but absolutely love the smell!